How many hats can fit on one head? 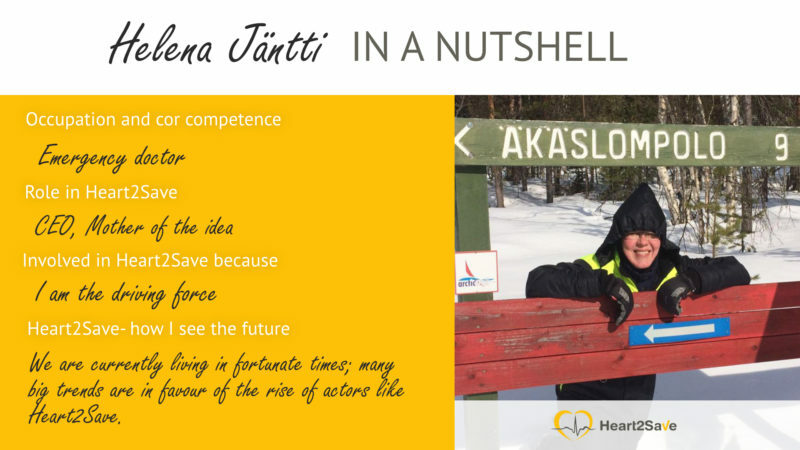 Helena Jäntti, CEO Heart2Save, has four. In addition to being CEO Helena works as an Emergency Doctor, teaches future doctors to-be and counsels with dissertations and doctoral theses. The newest one, the CEO hat, is the most unfamiliar for Helena. In the beginning, during discussions about the financing, one investor asked Helena who is going to buy the product. The answer the investor got was ”I am interested in who will survive.” Even as a CEO Helena is mostly interested in that the new product will save lives and people from getting strokes. “I am interested in who will survive”. Helena got the idea of a device that will detect arrhythmia in one of her patient’s living room. The call for medical help came in regarding an unconscious patient, which instead turned out to be a cardiac arrest. Nothing could be done for the patient. At that moment Helena pondered about the possibility of a device, that the patient could use at home in order to detect serious arrhythmia in time. That moment seven years ago was the start for Heart2Save. Even if the company has grown with people coming from both the medical and business world, Helena is known among her employees as a fantastic fountain of ideas, whether it is a matter of marketing or product development. From the very beginning, it was clear for Helena that the product would be a medical device. It means that the product has been developed with a foundation in scientific research and has passed the very profound and extensive documentation that is required of regulatory processes. The product can, therefore, be used for making diagnoses, unlike many other products falling within the scope of so-called wellness technology products. ”Developing a medical device feels like crossing an ocean with a rowing boat”. Heart2Save is a member of Upgraded, and we are always happy to post any news or texts from our members! Want to share your writings in Upgraded channels? Contact us!